The Pimsleur Method provides the most effective language-learning program ever developed. 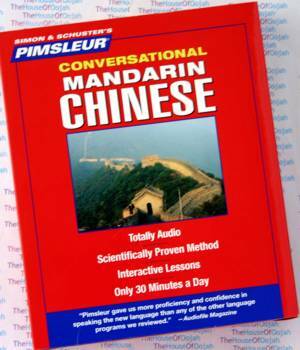 The Pimsleur Method gives you quick command of Chinese Mandarin structure without tedious drills. Learning to speak Chinese Mandarin can actually be enjoyable and rewarding. Traditional Chinese is a category of related Chinese dialects spoken across most of northern and south-western China. When taken as a separate language, as is often done in academic literature, the Mandarin dialects have more speakers than any other language. * to Standard Chinese or Standard Mandarin (Putonghua/Guoyu/Huayu/Hanyu), which is based on the particular Mandarin dialect spoken in Beijing. Standard Mandarin functions as the official spoken language of the People's Republic of China, the official language of the Republic of China (Taiwan), and one of the four official languages of Singapore. ‘Chinese’ — in practice Standard Mandarin — is one of the six official languages of the United Nations. * to all of the Mandarin dialects spoken in northern and south-western China. In everyday use, Mandarin refers usually to just Standard Mandarin (Putonghua/Guoyu). In its broader sense, Mandarin is a diverse group of related dialects, some less mutually intelligible than others. It is a grouping defined and used mainly by linguists, and is not commonly used outside of academic circles as a self-description. Instead, when asked to describe the spoken form they are using, Chinese speaking a form of non-Standard Mandarin will describe the variant that they are speaking, for example Sichuan dialect or Northeast China dialect, and consider it distinct from ‘Standard Mandarin’ (putonghua); they may not recognize that it is in fact classified by linguists as a form of ‘Mandarin’ in a broader sense. Nor is there a common ‘Mandarin’ identity based on language; rather, there are strong regional identities centred on individual dialects, because of the wide geographical distribution and cultural diversity of its speakers. Moreover, it is of note that despite its wide use in the Occident, most native Mandarin speakers are reluctant to recognize the term 'Mandarin', since the word does not reflect any Chinese origin. Instead, they would rather call the language simply 'standard Chinese'. From an official point of view, there are two versions of Standard Chinese Mandarin, since the Beijing government refers to that on the Mainland China as Putonghua, whereas the Taiwanese government refers to their official language as Kuo-yü (Guoyu in pinyin). Technically, both Putonghua and Guoyu base their phonology on the Beijing Chinese accent, though Putonghua also takes some elements from other sources. Comparison of dictionaries produced in the two areas will show that there are few substantial differences. However, both versions of ‘school’ Standard Chinese Mandarin are often quite different from the Mandarin dialects that are spoken in accordance with regional habits, and neither is wholly identical to the Beijing dialect. Putonghua and Guoyu also differ from the Beijing dialect in vocabulary, grammar, and usage. It is important to note that the terms ‘Putonghua (The Common Language)’ and ‘Guoyu’ refer to speech, and hence the difference in the use of simplified characters and traditional characters is not usually considered to be a difference between these two concepts.